Pick a size; pick a color; pick a finish for your holder (if you want one); and pick a font. 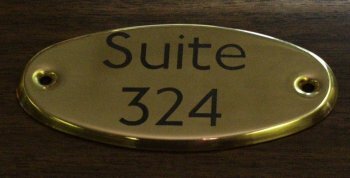 Once you've done that, give us the text and two business days later, your custom engraved door/wall sign will be on its way to you. You may need only a single wall sign. Our most popular choices are shown below. Item D140 - 2" x 8" - The most popular size! Item D140a - 2" x 10" is shown"
with gold or silver aluminum finish holder. 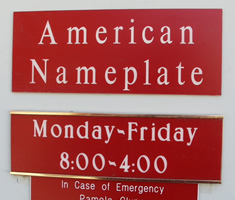 Plate size shown is 1" x 4"
We have a wide variety of sizes to accommodate your every need. Here's a 1/2"x3" which could be used to mark an apartment doorbell or mail slot. Options for all sizes include gold or silver colored plate. See our color chart for insert color selection. 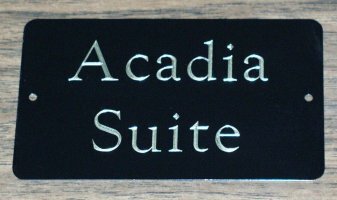 Our multiple interchangeable sign systems are a great choice when you need multiple wayfinding instructions. These can be created in any width and any height. The cost is inexpensive; the appearance is high quality and rich. 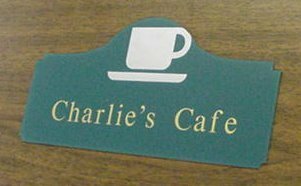 These signs come in a variety of finishes with engraved or back-painted inserts to match your color scheme (See our Color Chart for selection.). Take a look at our Directory Signs too! 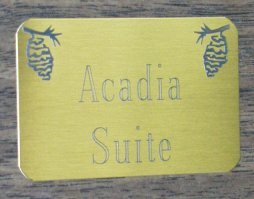 We can also provide framed signs in a variety of sizes. Please let us know what you'd like. 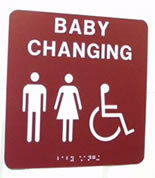 Corridors often need angle signs and we can provide them in a variety of sizes and options. For walls or doors, whatever you need WE CAN DO! 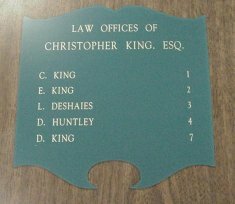 From the smallest tag that can hold a letter to signs 24"'x48"
We can drill holes (and provide the screws), apply double-sided foam tape, or 3M™ double-sided tape. 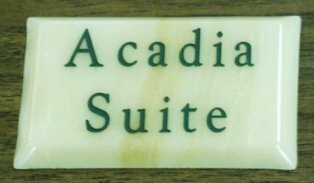 We can cut your sign to a particular shape, make it ADA compatible including braille. 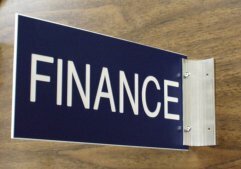 Whether it's a basic instructional sign or a directory, we can do it to YOUR specifications. Here's a picture which shows two different types of signs that can be used outdoors. These signs have been on the doors of one of our production locations for over five years. 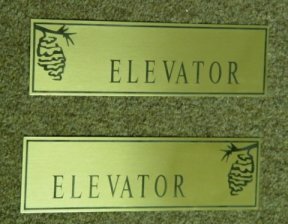 The upper sign is reverse engraved and paint-filled while the lower (framed) sign is a standard engraved piece placed in a metal holder. This door is NOT sheltered by any type of awning and is directly exposed to the rugged Maine weather. As you can see, they've done just fine (including the gold frame - that light/dark is simply the reflection of the rarely-seen sun!). These are examples of the quality product we will produce for you! Check HERE for some more information about indoor/outdoor usage!